The establishment have lied to us since 9/11, telling us Islam is the religion of peace. This book proves the opposite to be true and does it using Islam's own texts to do it. Once the Koran is read in its correct order it all becomes apparent and the authors have done an excellent job. Islam is the biggest threat to Western culture there has ever been and this book tells us why. The Muslim mind is different to the cultured Western mind because they see Mohammed's and his writings as being perfect. Once this is realised we can see why Muslim men are violent and hate non believers, it's all in the Koran. The more devout a Muslim is and the more closely he follows the life of the prophet Mohammed, the more violent he will be. It is very well researched and each assertion corroborated. The fact is that a section of society doesn't want this subject addressed, hence low scores, which is a shame: reviews should be about the book. Without such an examination the true problem will never be addressed and after each tragedy the same noises will be made. The funny thing is that the truest criticism of the book is almost made by itself: it's not new. The croissant is a key example! This message has been said again and again for a thousand years. Great book, would recommend. This book was long overdue, finally someone had the guts to do it! The Koran laid bare for all to see. We are always being asked "Have you even read The Koran?" every time we question anything to do with Islam. Now for millions of people the answer will be "Yes." ...and how non-Muslims have been duped into believing that it Islam is a religion of peace. Tommy Robinson, and Peter McLoughlin, hats off to you guys for the heads up. Knowledge is power. Tommy is an incredibly brave man putting his neck on the line to give us the real facts. An essential clarification to a the deliberately obfuscated subject - obfuscated by politicians and apologists alike. A great help to anyone who wants to understand a straightforward topic. And one that Muslims and non-Muslims should all welcome if, as is usually claimed, the problem is not Islam but the failure to understand Islam. This is an excellent guide if you have ever felt bamboozled by such talk. 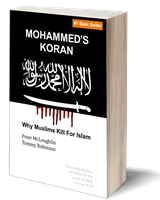 Without a doubt one of the best researched and honest books about Mohammed and the Koran..